Mail art is art which uses the postal system as a medium. The term mail art can refer to an individual message, the medium through which it is sent, or an artistic genre. 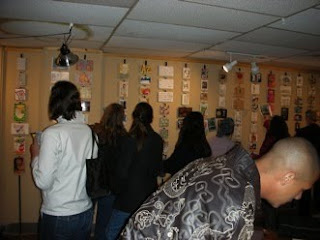 Mail art is also known as postal art and is sometimes referred to as Correspondence/Mail Art (CMA). Mail artists typically exchange ephemera in the form of illustrated letters, zines, rubberstamped, decorated or illustrated envelopes, artist trading cards, postcards, artistamps, faux postage, mail-interviews, naked mail, friendship books, decos, and three-dimensional objects. An amorphous international mail art network, involving thousands of participants in over fifty countries, evolved between the 1950s and the 1990s. It was influenced by other movements, including Dada and Fluxus. One theme in mail art is that of commerce-free exchange; early mail art was, in part, a snub of gallery art, juried shows, and exclusivity in art. A saying in the mail art movement is "senders receive", meaning that one must not expect mail art to be sent to oneself unless one is also actively participating in the movement. This project has brought be back to memories of my teenage-hood, when time did not translate to money and I was free to invest my energy where I wanted without concern of bills that needed to be paid. In the late 80’s and early 90’s I had never heard about the mail art movement, however in the spirit of passionate fun (and also because I was often grounded to my room with nothing else to do), I spent hours decorating envelopes with colored markers and pencils. I would cover nearly every part of each envelope with little flowers, rainbows, peace signs, hearts, eyeballs, ankh symbols - blue, green and brown earth globes and other planets and stars. I would outline the images in a black ball point pen. I loved to make vivid psychedelic letters that would be a treat to the person receiving it. As an added bonus, I learned that when I wanted to get someone’s attention, these letters were the way to do it. Every day, I would anxiously await the arrival of the mail truck. Some days I would receive nothing, other days I would receive more than several pieces of mail. Most of the celebrities and other interesting folks I wrote to would write me back. Some of them wrote long letters, some sent signed photos or photo postcards. Occasionally, I would get an actual gift or a phone call. Later on, in my late teens, I lived on my own and was consumed with the responsibilities of paying rent and other bills. I was exhausted from working minimum wage jobs. In my spare time I hung out with my friends so all my time was accounted for. I stopped creating mail art. 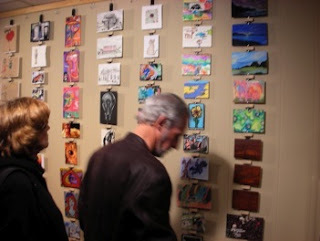 Recently I became aware of the fact that a number of galleries around the world host these mail art gallery events, and anyone can participate. You don’t have to be an accomplished or traditionally skilled artist to express yourself on a blank postcard and get your art seen. You can even get credits on your artist resume for these shows! It’s always great to have an old passion re-sparked! Try googling ‘mail art’ to find galleries that are accepting submissions. If I find any good ones, I will post about them here in a future entry.